LATS LEGO Approximate Tooth Spacing The spacing of teeth on a linear gear element such as piece 3743. This is 2/5 of a LSS, or 3.1944±0.0008 mm. As the name implies, it is an approximation to the "ideal" spacing which is LITS. Conveniently it is exactly the same as LPH. LBH LEGO Brick Height The height of a normal LEGO® brick, not including the bumps on top. By definition, 1 LBH = 1.2 LSS. Therefore, 1 LBH = 9.5832±0.0024 mm. LDU LDraw Unit A unit used in the CAD/CAM program LDraw for creating 3D models of LEGO constructions. (LDraw is a popular alternative to the official LEGO design software.) The LDraw unit 1/20 of an LSS, and it also evenly divides the LBH and LPH. One LDU = 1/20 LSS = 0.3993±0.0001 mm. LGDU LEGO Gear Distance Unit The distance two LEGO® gears have to be to mesh well, divided by the total number of teeth. (For example, two 8-tooth gears have a total of 16 teeth, and they have to be 16 LGDU apart to mesh well.) By design, 16 LGDU = 1 LSS. Therefore, 1.0 LGDU = 0.499125±0.000125 mm1. LITS LEGO Ideal Tooth Spacing The spacing of teeth around the circumference of a LEGO® gear. The standard engineering term is circular pitch. Ideally it would be 2 π times the LGDU, or about 3.1361±0.0007854 mm. The linear gear rack element, piece 3743 has 10 teeth; its length is 4 LSS = 31.944 mm long, which is a close approximation of 10 LITS = 31.361 mm. Other parts like the worm gear take advantage of the same close approximation. LPH LEGO Plate Height The height of a LEGO® "plate" (such as piece 3020), which is one third of the height of a normal LEGO® brick, not including the bumps on top. By definition, 3 LPH = 1 LBH. Therefore, 1 LPH = 3.1944±0.0008 mm. LSS LEGO Stud Spacing The horizontal spacing between adjacent "bumps" on a LEGO® brick. Experimental measurement of carefully constructed long "walls" of long bricks shows that the LSS is 7.986±0.002 mm. 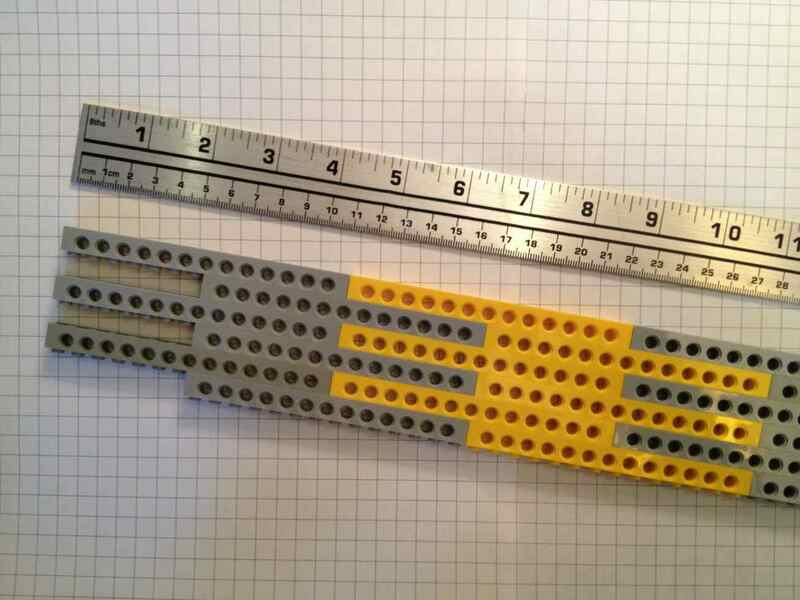 For example, measuring a length of 112 studs with the meter-stick pictured, I get 895 millimeters (to within ± 0.2 mm), which is clearly about 1 mm less than the length you'd expect if the LSS were exactly 8 mm. 1 : Yes, that's right, we know the LGDU to within 125 nanometers.